Brian Kelly, CEO of BKCM, LLC and Greg King, founder and CEO of REX Shares discuss BKC. 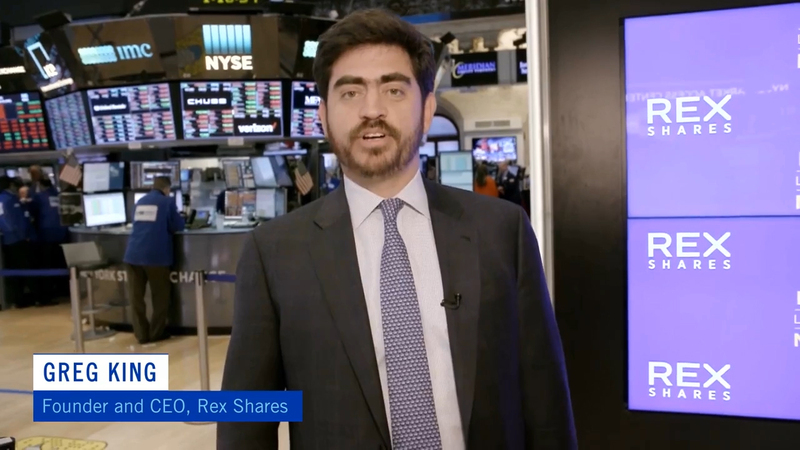 WESTPORT, Conn.--(BUSINESS WIRE)--REX Shares, LLC (REX) and Brian Kelly, CEO and Founder of BKCM Funds, LLC (BKCM), today announced the launch of the REX BKCM ETF (NYSE Arca:BKC). Brian Kelly will serve as portfolio manager of the fund, actively managing a portfolio of companies seeking to profit from, the advancement of blockchain1 technology and the rise of cryptocurrency2 adoption. With over 30 industries exploring the use of blockchain, the emerging technology may fundamentally transform the way business is transacted. This disruptive innovation could impact supply chains, healthcare, governments, and financial services companies, among others. REX Shares believe in empowering investors. We help make the investing world flat by democratizing access to investment strategies of all kinds. REX overcomes barriers to deliver investment products that seek to level the playing field. REX was founded by Greg King, creator of over 85 exchange-traded products for Barclays, Credit Suisse, Global X Funds, and VelocityShares. Founded by Brian Kelly, BKCM Funds, LLC is an investment firm specializing in macroeconomics and digital assets. Brian Kelly is an investor, author, and financial markets commentator. He is an expert in global financial markets, macro-economics, and digital currencies. Brian Kelly has over twenty years' experience in financial markets and is the author of the book The Bitcoin Big Bang – How Alternative Currencies are About to Change the World. He is a CNBC contributor and can be seen regularly on Fast Money. 1Blockchain is a decentralized, digitally disseminated ledger of data. The basis of a successful blockchain system is once a new group of information, or “block”, is added, the information automatically disseminates and is downloaded to each computer on the network. This assures that if one computer tried to change information on a block, the consensus of all the other computers’ blocks would triumph. This process renders all information on a completed block decentralized and theoretically permanent. 2A cryptocurrency is a digital currency typically utilizing a Blockchain system for transaction records and cryptography for security. The major differentiator from physical currency is it isn’t issued by a central authority and thus theoretically acts independently of traditional banking and government influence. Exchange Traded Concepts, LLC serves as the investment advisor and Vident Investment Advisory & BKCM Funds, LLC serves as sub advisor to the fund. The Funds are distributed by Foreside Fund Services, LLC., which is not affiliated with Exchange Traded Concepts, LLC or any of its affiliates.